Ted Cruz's horrifying idea of health reform. 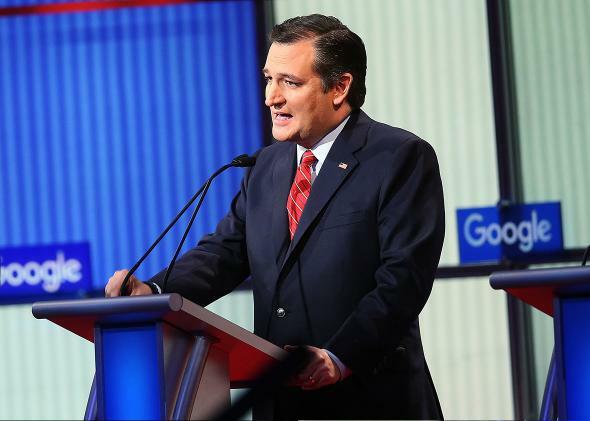 Ted Cruz hinted at a cruel plan to replace Obamacare at the debate in Des Moines, Iowa, on Jan. 28, 2016. Pressed on how exactly he planned to replace Obamacare during Thursday’s Republican debate, Ted Cruz offered a subtly callous answer that suggested he had no plans to guarantee health coverage for Americans with pre-existing conditions. If I am elected president, we will repeal every word of Obamacare. Now, once that is done, everyone agrees we need health care reform. It should follow the principles of expanding competition, empowering patients, and keeping government from getting between us and our doctors. Three specific reforms that reflect those principles: No. 1, we should allow people to purchase health insurance across state lines. That’ll create a true 50-state national marketplace while will drive down the cost of low-cost catastropic health insurance. No. 2, we should expand health savings accounts so people can save in a tax-advantaged way for more routine health care needs. And No. 3, we should work to delink health insurance from employment, so if you lose your job, your health insurance goes with you, and it is personal, portable, and affordable, and I tell you, Bret I think that’s a much more attractive vision for health care than the Washington-driven, top-down Obamacare that is causing so many millions to hurt. Notice what’s missing: Any mention whatsoever of how patients with pre-existing conditions, who were routinely denied coverage by insurance companies prior to health reform, would be taken care of. Obamacare, of course, dealt with this issue by requiring insurers to cover everybody, while also requiring that every adult buy insurance so healthy customers could subsidize older, sicker ones and balance out the markets. Standard conservative alternatives to Obamacare have gone a separate route, proposing heavily subsidized “high-risk pools,” which amount to special insurance plans for the sick. In order to function properly, high-risk pools would theoretically require a substantial amount of government backing, which is perhaps why Cruz doesn’t call for them. But he also didn’t suggest anything in their place Thursday. Health savings accounts will help people cover basic checkups and some specialist visits. Letting people buy insurance across state lines might indeed make it easier for people to find plans offering basic catastrophic coverage (and not much else) at rock-bottom prices. Making insurance portable from your job would, well, make it portable. But there’s zilch in those principles that applies to pre-existing conditions. It may be that Cruz simply expects that states will once again set up their own high-risk pools, as many did before the Affordable Care Act. But those plans were poorly used because of the threadbare and expensive coverage they offered. This isn’t the first time Cruz has outlined his principles on health care this way. It’s an oblique way of telling the sick to drop dead, and not much more.